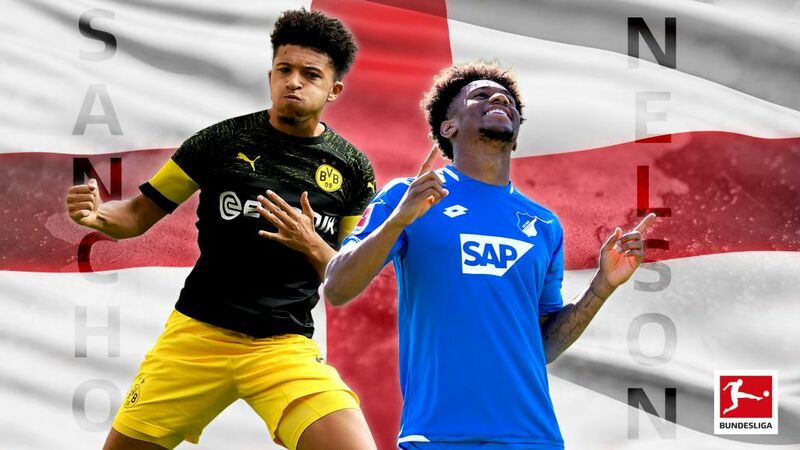 In 18 games between them this season, Jadon Sancho and Reiss Nelson have provided 10 goals and six assists between them for Borussia Dortmund and Hoffenheim. Born and raised in London, Sancho and Nelson are now growing together as professionals in Germany's top flight, showing how age is just a number, and that English players can do it abroad. "When I saw Jadon and Reiss I thought 'these boys are mad.' Jadon was just making people look stupid. The nutmegs, the skills. Some were outrageous. And it was other academy players they were doing this against." Those the words of Sayce Holmes-Lewis, speaking to the Daily Mail, who was the coach of a very special U11 team at the Southwark London Youth Games in 2011. Childhood friends Sancho and Nelson played and won the tournament together seven years ago as 11-year-olds and it was clear, even back then, that the pair were something incredibly special. "Jadon and Reiss were both phenomenal players," said Holmes-Lewis. "You knew they would go into the professional game. They were different from anything out there and had this ability to manipulate the ball at a young age. At times, because of their friendship, it was telepathic between them on the pitch." Growing up in South and Central London together, the path to professional football would usually take a pair of talented English teens into the English Premier League. However, the lack of opportunity for young homegrown stars at home meant that Sancho needed to look elsewhere for his first-team chance, which he had unquestionably earned after helping England to win the U17 World Cup in 2017. One goal and four assists in 12 appearances, mostly during the second half of the 2017/18 season, put Sancho's name on the Dortmund map. His talent was now known – especially after his one goal, two assist performance against Bayer Leverkusen – and Dortmund fans wanted more. And despite being only 18, the first Bundesliga goalscorer born in the 21st century has continued to create history for himself, Dortmund and the league itself. "Honestly, them giving me opportunities at such a young age, I just have to thank the club and all my family that have been behind me from the start," Sancho said after helping Dortmund thrash VfB Stuttgart 4-0 on Matchday 8 of this season. Some of that support came from Nelson, who at the time of Sancho's initial breakthrough in the Bundesliga was playing a bit-part role for Arsenal. After a summer break, Nelson followed in his best friend's footsteps to reap the rewards of a move to a new country, language and culture, which Sancho himself encouraged him to do. "Jadon knows I like one against ones," Nelson told the Daily Mail. "He knows I'm a fast player and said there were a lot of those opportunities [in the Bundesliga]. We've got a lot of similarities so he said I should go over there and that's how I can show my brilliance." Watch: We meet Reiss Nelson! Nelson has been quick to do just that, scoring four goals with his first five shots at Hoffenheim. Two of those goals came in just seven minutes against Nuremberg on Matchday 8, with Nelson scoring just the fourth Bundesliga brace by an Englishman, following the footsteps of Kevin Keegan, Tony Woodcock, and former RB Leipzig loanee, Ademola Lookman. "What he brings with his tempo and his one-on-one ability, we didn't have so much of that in the squad," said Hoffenheim coach Julian Nagelsmann in explaining why Nelson had been lured to the WIRSOL Rhein-Neckar-Arena. "It was my wish to add that." And that fearless, attacking one-on-one style of play is exactly what has caught the attention of everyone in the footballing world, whether in Germany or England. Despite not playing together at senior professional level yet, Sancho and Nelson have already shown that a linguistic and cultural difference is no barrier when you speak the language of football. Watch: What makes Sancho such an asset to Borussia Dortmund? Sancho has combined with Spanish striker Paco Alcacer and the pair have provided a goal every 49 minutes in the Bundesliga this season: the best mark of any duo in Europe's top five leagues. Nelson, meanwhile, has managed a goal every 93 minutes with Hungarian forward Adam Szalai, which is equal to the current English Premier League campaign's most productive duo, Eden Hazard and Pedro of Chelsea. It looks likely that records will continue to be broken by this marvellously talented pair. At just 18, the best friends from London are showing that the Bundesliga is the best league around for nurturing young talent, no matter what your passport says.